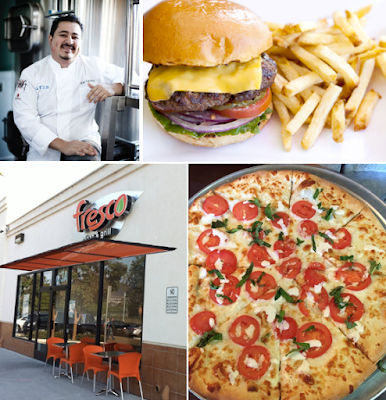 Chef Alex Carballo and his business partner Mario Warman, who are in the process of opening Moto Deli in Encinitas, have purchased Fresco Pizza & Grill, located at 13350 Camino Del Sur in Torrey Highlands. Chef Alex Carballo is a frequent participant in San Diego events and is known for his previous roles as chef/partner at URBN Coal Fired Pizza in El Cajon and Executive Chef at Stone Brewing Co. World Bistros. Chef Alex and Mario Warman are currently operating the Moto Deli Food Truck until Moto Deli's brick-and-mortar location opens at 810 North Coast Highway 101 in Encinitas at some point this summer. The duo will make only minor changes to the menu and decor at Fresco Pizza & Grill until the end of summer when they intend to do a full revamp of the concept to add some artistic flare, chef-driven dishes and unique pizza combinations. Nationally respected as of one of Restaurant Hospitality Magazine’s “12 to watch in 2012”, Alex Carballo has been noted in top industry publications such as Food & Wine, Sunset Magazine and Draft Magazine. Chef Alex manned the helm in some of San Diego’s most prestigious kitchens (Crosby Country Club, Indigo Grill, Brigantine and The Fishery), but it was his five-year stint as General Manager/Executive Chef at Stone Brewing World Bistro & Gardens in Escondido that earned his regional acclaim. In addition to being a co-owner of Moto Deli and Fresco's Urban Cafe, Carballo is also a consulting chef for various restaurants around Southern California and is currently a partner at URBN Pizza El Cajon. Fresco Pizza & Grill currently has a menu offering NY-style pizza & pasta, burgers & sandwiches made with all-natural means, hearty salads, healthy plates, and a selection of local craft beer. For more information, visit frescosd.com.